Born: Henrietta Kanengeiser in Vienna, 1889. Family: Married third husband, John Zanft, in 1928. Career: Left school at age 11 and moved with parents to New York, 1900; established as Carnegie-Ladies Hatter, 1909; opened custom dressmaking salon, 1918; offered Paris models after first buying trip to Europe, 1919; opened East 49th Street building to sell own label, imports, and millinery, 1925; added ready-to-wear, 1928; Hattie Carnegie Originals carried in stores throughout the U.S. by 1934; custom salon closed, 1965. 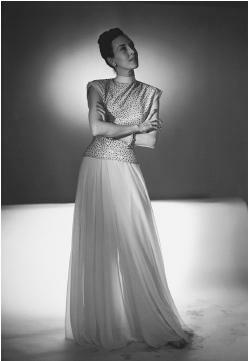 Awards: Neiman Marcus award, 1939; Coty American Fashion Critics award, 1948. Died: 22 February 1956, in New York. Epstein, Beryl Williams, Fashion is Our Business, Philadelphia and New York, 1945. Design by Hattie Carnegie: sequined dinner ensemble. Steele, Valerie, Women of Fashion: Twentieth Century Design, NewYork, 1991. "Luxury, Inc.," in Vogue (New York), 15 April 1928. "Profiles: Luxury, Inc.," in the New Yorker, 31 March 1934. "Hattie Carnegie," in Current Biography (New York), October 1942. Bauer, Hambla, "Hot Fashions by Hattie," in Collier's (Philadelphia),16 April 1949. "Hattie Carnegie" (obituary), in the New York Times, 23 February 1956. For decades Hattie Carnegie's personal taste and fashion sense influenced the styles worn by countless American women. Whether they bought her imported Paris models, the custom designs, the ready-to-wear collections, or the mass market copies of her work, women welcomed Carnegie's discreet good taste as a guarantee of sophistication and propriety. Carnegie's business ability and fashion acumen enabled her to build a small millinery shop into a wholesale and retail clothing and accessory empire and made her name synonymous with American high fashion for almost half a century. Carnegie's place in fashion history was assured not because of her own designs, but because of her talent for choosing or refining the designs of others. Between the World Wars, the list of couturiers whose models she imported included Lanvin, Vionnet, Molyneux, and Mainbocher—classic stylists—but also select creations for Chanel and Patou, Schiaparelli, and Charles James. In fact, Carnegie claimed in an April 1949 Collier's article to have had a three-year unauthorized exclusive on selling Vionnet models in the early 1920s, a few years before Vionnet started selling "to the trade." The Custom Salon was generally considered to be the heart of the Hattie Carnegie operation, since it was with made-to-order fashion that Carnegie began. The focus of her business was to interpret European style for American consumers, but the sense of dress she chose to champion was not contained in the minutiae of design. It was instead an approach to fashion that emphasized consummate polish in every outfit. Norman Norell, who was with Carnegie from 1928 to 1940 (primarily as a ready-to-wear designer), remarked in American Fashion (New York, 1975) that he often worked from models that Miss Carnegie had brought back from Paris. He could legitimately claim, however, that he had imprinted his own signature on his designs for the firm, and it is often possible to make an informed attribution of Hattie Carnegie styles to her other designers. Certainly one gown featured in a 1939 magazine layout is recognizably the work of Claire McCardell, who spent two years with the firm. Others who worked for Carnegie were Emmett Joyce, Travis Banton, Pauline Trigére, Jean Louis, James Galanos, and Gustave Tassell. Carnegie was already established as a taste-maker by the time she added the ready-to-wear division to her company in the 1920s. "Vogue points from Hattie Carnegie" contained her style tips and forecasts for Vogue readers. At the Hattie Carnegie salon, a customer could accessorize her day and evening ensembles with furs, hats, handbags, gloves, lingerie, jewelry, and even cosmetics and perfume— everything, in fact—but shoes. The Carnegie customer, whatever her age, seems to have been neither girlish nor matronly, but possessed of a certain decorousness. Even the casual clothing in the Spectator Sportswear and Jeunes Filles ready-to-wear departments was elegant rather than playful. The Carnegie Suit, usually an ensemble with dressmaker details in luxury fabrics, traditionally opened her seasonal showings. She often stressed the importance of black as a wardrobe basic, both for day and evening, but was also famous for a shade known as "Carnegie blue." Perhaps Carnegie's preference for 18th-century furnishings in her home relates to the devotion of formality so clearly expressed in her business. 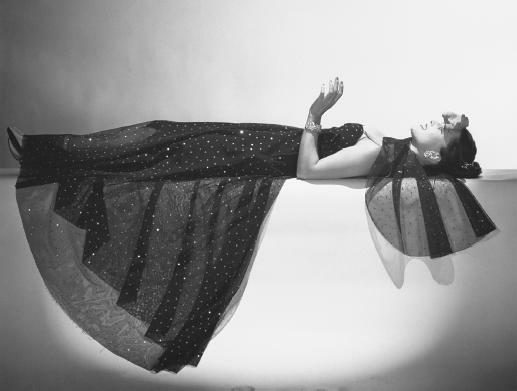 Design by Hattie Carnegie: sequined-studded rayon and cotton net dress and cape. specialty firms such as Hafner Associates and Onondaga Silks, which were not immersed in war work. She also used fabrics designed and hand-printed by Brook Cadwallader, and continued to do so after French materials again became available. Only after Carnegie's death did the company claim to use exclusively imported fabrics. Hattie Carnegie died in 1956; the fashion empire she had built survived into the 1970s, but in 1965 the custom salon was closed and the company concentrated on wholesale businesses. The informal youth culture of the 1960s and 1970s was ill-suited to the type of clothing and client that had made Hattie Carnegie's reputation. The strength of her personal identification with the company made it difficult for it to succeed without her, and it quickly lost ground to the younger desginers who emerged in the 1960s. Did Hattie Carnegie ever design/make sterling silver jewelry? Searching for buyer for mother's vicuna coat from the 1950s, the Eisenhower/Sherman Adams time. This seldom worn, full length coat is from Montaldo's in St. Louis; a Hattie Carnegie original with matching fur-lined hat. Stored and in excellent condition. Photos on request. What is it's value?